Pastor Bernie Kelly and Deacon Karen Kelly attended Wissahickon High School in Ambler, Pa where they met and became high school sweethearts. Karen is a cradle Lutheran and attended St. John Evangelical Lutheran Church, Center Square, PA. Bernie had no religious affiliation until he started attending St. John with Karen. (It was a date their parents couldn’t forbid!). Karen attended Germantown Hospital School of Nursing and Gwynedd-Mercy College and Bernie attended Drexel University. After graduating, Karen began working as an R.N. and Bernie began working as an accountant. Bernie and Karen were married at St John and they eventually became the sextons at that church when they were expecting their son, Josh. Their intent was to stay there while Josh was a baby and then move on. During their time serving as sextons (which turned into 13 years! ), they became more involved in the church and Bernie eventually felt a call to become a pastor. He attended the Lutheran Theological Seminary in Philadelphia (LTSP) and earned his Master of Divinity. He was called to serve St. John Lutheran Church, Richlandtown, PA in 1997. Pr. 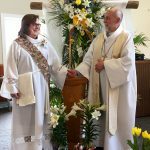 Kelly served St. John for ten years before being called as pastor to Family of God Lutheran Church, Buckingham, PA in 2007. He was then called to Messiah Lutheran Church, outside of Sea Isle City, NJ in 2012. While Karen continued working as an R.N., she too sensed her own call to seminary. While not feeling called to become a pastor, Karen pursued a call to become a Diaconal Minister, a roster of the Evangelical Lutheran Church in America (ELCA) at that time whose call was to take the proclamation of the Gospel from the church out into the world and bring the needs of the world back to the church. Karen also attended LTSP and earned her Master of Arts in Religion in 2008. She was consecrated as a Diaconal Minister of the ELCA and served as a hospice chaplain for several different hospices. In 2016, the ELCA united 3 different rosters in the Church (Diaconal Ministers, Deaconesses and Associates in Ministry) and they became known as Deacons and are considered Ministers of Word and Service. Pastors are Ministers of Word and Sacrament. Both Pastor and Deacon Kelly have a passion for bringing the Gospel of Jesus Christ to those who are broken, hurting, or desiring to grow in their relationship with Jesus. They love spending time with family, especially their son, Josh, daughter-in-law Beth, and their granddaughter Maddie. They also love spending time with friends and family at the beach, especially Ocean City, NJ. They enjoy canoeing/kayaking, reading, music, movies, and going to the theater. Pastor and Deacon Kelly live in Phillipsburg with their dogs, Barney and Winston and their cat, Linus.